The company operating the pipeline that recently leaked thousands of gallons of crude oil off the California coast says it may be months before investigators learn what went wrong. Officials say they’ve been able to rake up over 9,000 gallons of oil around the vicinity where the leak was spotted earlier this week, but cleanup efforts aren’t expected to end anytime soon, and determining the cause of the leak may still take some time. Plains All American Pipeline on Friday said it could be weeks, or perhaps months, before investigators determine what caused upwards of 105,000 gallons of crude to escape into the Pacific Ocean earlier this week near Santa Barbara, California. “We have not even uncovered the pipe yet,” Patrick Hodgins, the company’s senior director of safety, told reporters on Friday. According to the Associated Press, Plains officials can’t say whether two malfunctions that occurred before Tuesday’s spill sparked the disaster. In accordance with requirements of the Pipeline and Hazardous Materials Safety Administration, Plains will have to remove the broken parts of the pipe, conduct analyses, and then drain the rest of the line. The company shut the flow of oil going through Line 091 on Tuesday morning, California’s KTLA News reported, after a drop in pressure was discovered. A service order was issued in the early afternoon, and the leak was confirmed around two hours after the pressure drop was first reported. California Gov. 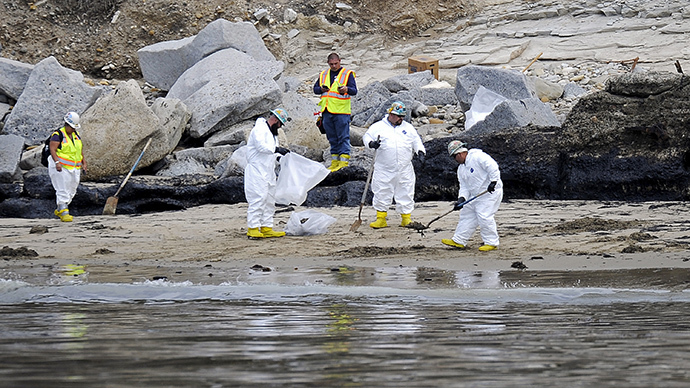 Jerry Brown was driven to declare a state of emergency after the spill occurred on Tuesday. Originally the United States Coast Guard suspected only around 21,000 gallons of oil had ended up in the ocean, but in the days since Plains has admitted that the actual amount could be upwards of five-times that figure.